The Australian Catholic Bishops Conference mourns the death of former Archbishop of Sydney Cardinal Edward Clancy, who died today at the age of 90 years. 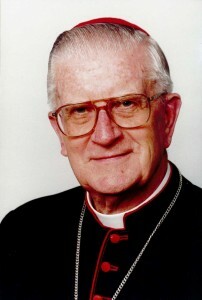 Cardinal Clancy was President of the Australian Catholic Bishops Conference from 1986-2000. During his tenure, he launched the Bishops’ Research Project on ‘The Participation of Women in the Catholic Church in Australia’ at the Press Club in Canberra on 21 August 1996. Bishop of Wollongong, Peter Ingham, worked in the Sydney Archdiocesan Chancery under Cardinal Clancy for seven years between 1983-1990. “The Cardinal had a refined sense of humour, and enjoyed playing tennis in earlier years, some golf and cycling in Centennial Park,” Bishop Ingham said. “In the years of his tenure as Archbishop, Cardinal Clancy oversaw the formation of the Australian Catholic University on which he served as Chancellor, the closure of St Patrick’s Seminary Manly to be re-established as the Seminary of The Good Shepherd at Homebush, and The Catholic Institute of Sydney, Strathfield,” Bishop Ingham added. General Secretary of the Australian Catholic Bishops Conference, Fr Brian Lucas worked with Cardinal Clancy as the Sydney archdiocese secretary from 1990 to 2001. “Cardinal Clancy will be remembered not only by decisions such as the creation of the dioceses of Broken Bay and Parramatta but for his strong leadership in the beatification and eventual canonisation of Mary MacKillop,” Fr Lucas said. This entry was posted in Uncategorized on August 3, 2014 by Mark Wei.